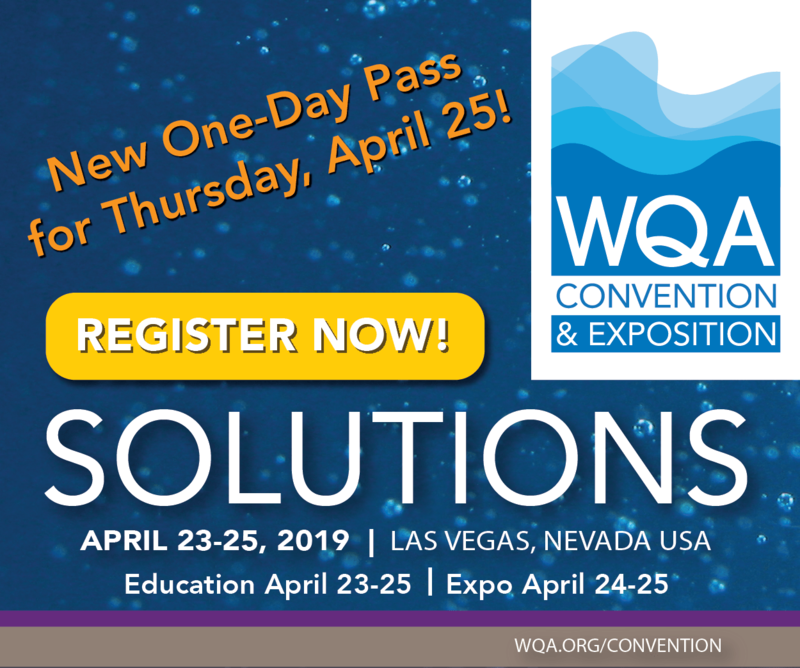 Many water and wastewater sources contain contaminants that are most effectively and economically removed by various media materials. As with virtually all treatment technologies, suspended solids will degrade the performance of these media. Fortunately, other media are applicable for reduction of suspended solids. This article will describe many of these media, detail their performance properties and discuss various applications. 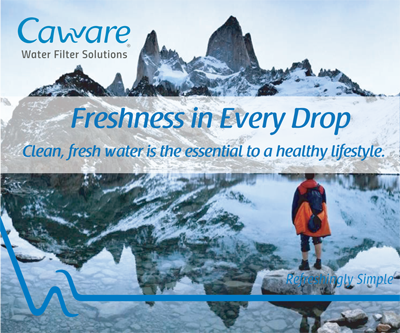 Many raw water supplies contain what are called problem water contaminants, slightly soluble salts such as calcium carbonate, iron and manganese, the dissolved gas, hydrogen sulfide and the disinfectant, chlorine. They are considered problems for several reasons, summarized in Table 1. Calcium carbonate (hardness), along with magnesium (to a lesser extent), is in a saturated state in virtually all fresh water supplies. This means that the precipitated CaCO3 forms scale on any surface from which the water evaporates: water fixtures, tea kettles, etc. Iron, in the ferric (Fe+++) form is insoluble [Fe(OH)3]. Groundwater, while still in the well, usually contains iron in the soluble ferrous (Fe++) form. When this water is exposed to air (or an oxidant), the ferrous ion is converted to the insoluble ferric form, resulting in aesthetic issues (staining, taste). Manganese behaves similarly to iron; however, it requires a stronger oxidizing agent than that required for iron. 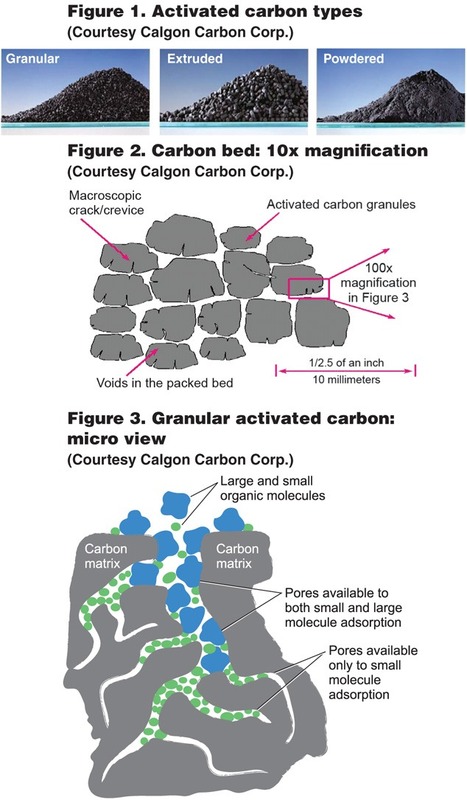 Hydrogen sulfide can be oxidized to free sulfur and is usually removed from well water supplies by catalytic carbon, a form of activated carbon described below. Hydrogen sulfide is normally found in well waters, resulting from sulfate-reducing bacteria operating in an anaerobic environment. Chlorination of the well usually inactivates the bacteria and prevents further H2S formation. 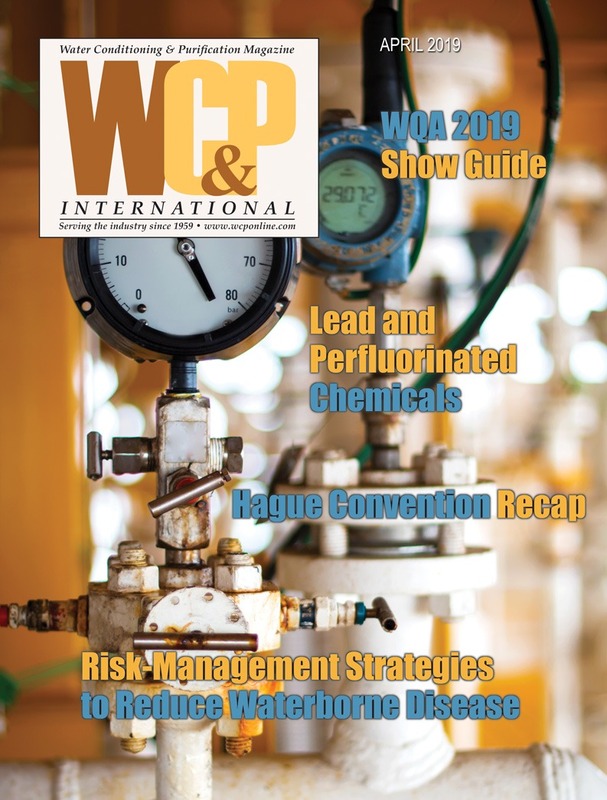 Chlorine is not found in untreated water supplies; however, it is added by virtually all US municipal water treatment plants in order to inactivate pathogenic microorganisms. As many people believe it imparts an objectionable taste and odor to drinking water, it is often removed by POU treatment with activated carbon. 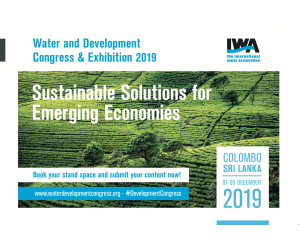 There are a plethora of technologies available, which are discussed in detail below, to remove these problem water contaminants. — Lower pH to 6.0, converting 80 percent of the bicarbonate ion to carbon dioxide gas, then remove it with a scrubber or gas transfer membrane (e.g. Liqui-Cel). — Add lime and soda ash to raise the pH to precipitate calcium carbonate as a sludge. • Iron and manganese, as indicated by their close proximity in the Periodic Table of Elements, behave similarly in chemical reactions. They are both readily oxidized by chlorine or other oxidizing agents (iron can be oxidized by air, but manganese cannot) and the insoluble product easily removed by filtration. • Hydrogen sulfide is a water-soluble gas, but can be readily oxidized to free sulfur and ultimately to sulfate ion (SO4=). Many of the oxidizing media used for iron and manganese removal are also effective with hydrogen sulfide. Typical oxidizing agents include: chlorine, ozone (O3), hydrogen peroxide (H2O2) and, to a lesser extent, potassium permanganate (KmnO4). 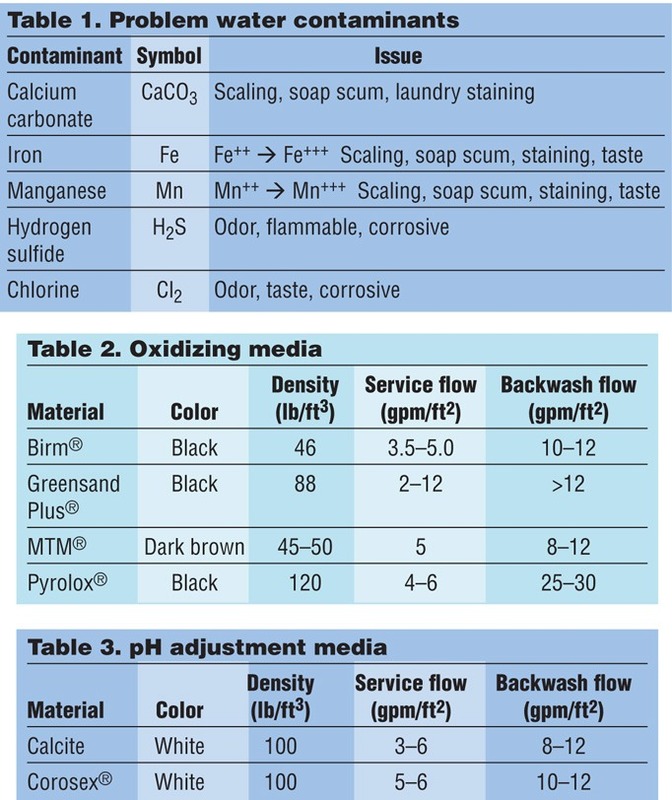 Table 2 lists the media available for oxidation and filtration of the above contaminants. These media are most widely used for light industrial, commercial and residential applications. Table 3 describes the media to raise the pH of acidic water supplies. The service flowrate is the recommended flowrate to the filter as a function of the surface area of the filter bed. The backwash flowrate is based on the requirement that the media be lifted sufficiently to loosen the grains to allow suspended solids to be released and removed from the media. Again, the backwash flowrate is a function of the bed area and is always higher than the service flowrate. Birm® is aluminum silicate with a manganese dioxide coating. 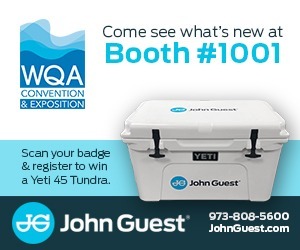 It works best with a dissolved oxygen content above 15 percent of the iron content and a pH of 6.8 or higher. The free chlorine concentration (that remaining after oxidation and microorganism inactivation) should be less than 0.5 mg/L. Birm will not oxidize hydrogen sulfide. The water should not contain polyphosphates. Greensand Plus® is silica sand with a manganese dioxide coating. 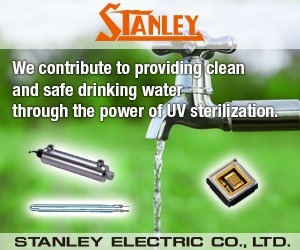 It is designed for applications with a continuous chlorine feed and a minimum pH of 6.2. It will remove hydrogen sulfide as well as iron, manganese, arsenic and radium. MTM® is also a manganese dioxide-coated medium with similar operating requirements to Greensand Plus. 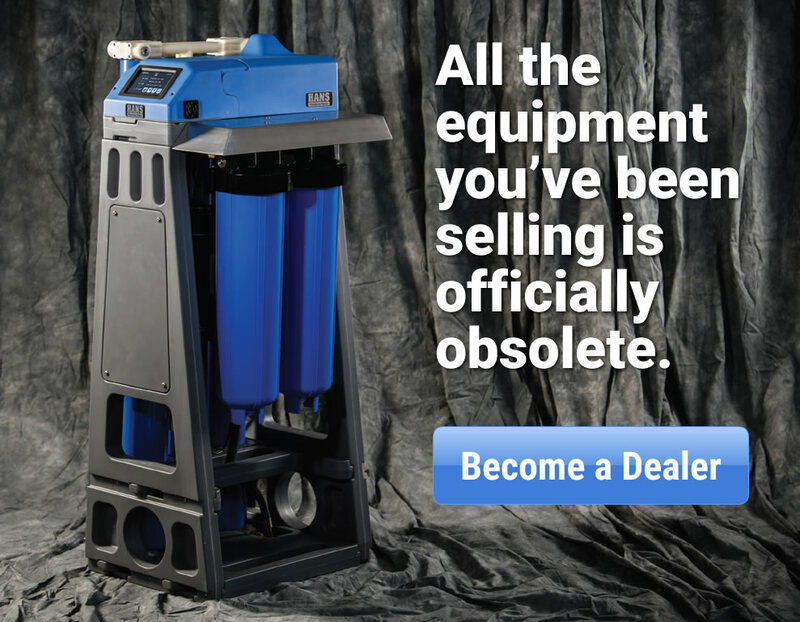 Its main advantages are that it does not require that dissolved oxygen be present, is successful at a pH as low as 6.2 and can accommodate a lower backwash rate. A continuous feed of chlorine or potassium permanganate (or both) is recommended. Pyrolox® is a natural ore for removal of iron, manganese and hydrogen sulfide. It requires continuous oxidant feed (hydrogen peroxide cannot be used) and a pH above 6.5. A very dense medium, a high backwash rate is necessary. Calcite is a natural granular calcium carbonate (limestone) which dissolves in acidic waters, adding bicarbonate ion and raising the pH, alkalinity and hardness. 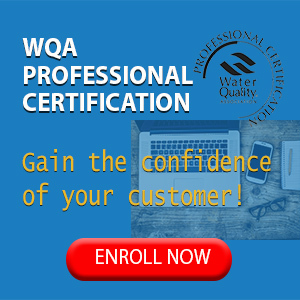 It is most effective on waters with pH between 5 and 7 and will generally not raise the pH above that required for non-corrosive equilibrium (LSI=0). 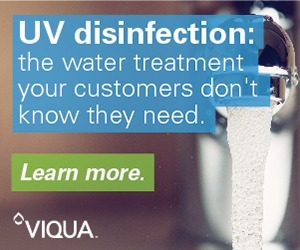 Because it dissolves, it must be replaced during use. Corosex® is magnesium oxide used to rapidly naturalize waters with very low pH. Under certain conditions, it may raise the pH too high and cause hardness minerals to precipitate. Activated carbon is tried-and-true media. 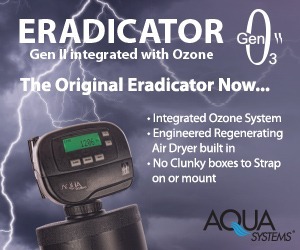 They have been around for years and are very effective for the removal of chlorine, chlorination byproducts (trihalomethanes), certain organic compounds and gases, such as hydrogen sulfide and radon. This unique versatility is primarily a function of the specific carbon material. In addition to the carbon source, another factor affecting performance is the time the contaminant is in contact with the medium. Activated carbon media are manufactured from such carbonaceous sources as coal, lignite, wood, coconut shells and numerous other materials. The manufacturing process creates carbon grains (particles) with many pores, creating a very large surface area. This surface attracts contaminants and adsorbs them. Adsorption is the attachment of molecules of the contaminant to the surface of the medium. This is opposed to absorption, which involves the penetration of the contaminant into the body of the medium, as in a sponge. Activated carbon is available in many mesh sizes; Figure 1 depicts its various forms. Figures 2 and 3 show this medium in various degrees of magnification. 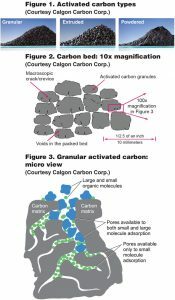 Carbon block cartridges, constructed from powdered activated carbon, are capable of both filtration and adsorption. A relatively new development, some are available with sub-micron filtration properties. Empty bed contact time (EBCT) is defined as the total volume of the media bed divided by the flowrate. 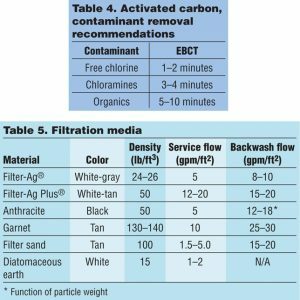 In other words, EBCT defines the length of time a waterborne contaminant is in contact with the activated carbon media in a vessel. 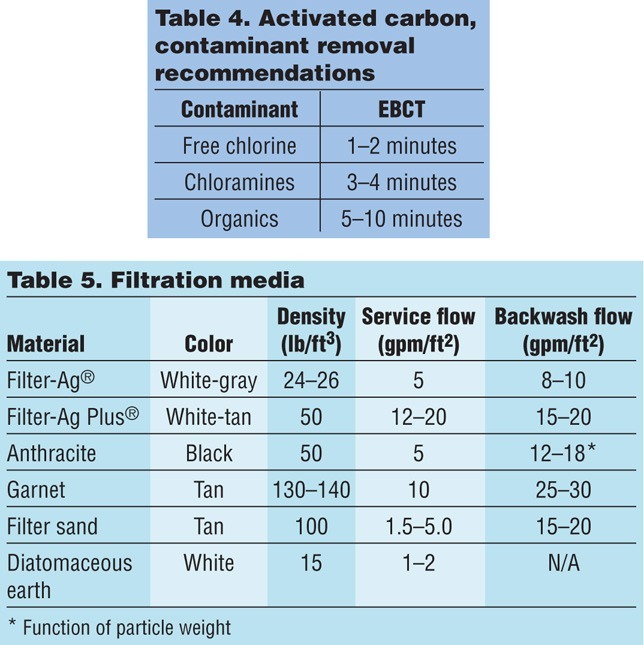 Table 4 lists the EBCT requirements for removal of certain contaminants. Many different media, mostly natural minerals, are used both for suspended solids removal and as support for other media, such as those used for oxidation-filtration or pH adjustment. In general, the higher density media are utilized for under-bed or support layers as they will settle on the bottom of the filter vessel during backwashing. Generally, it is advisable for the top layers of the bed to consist of large grains of an angular medium with high surface area that promotes capture of large suspended solids, while allowing smaller particles to penetrate down inside the bed for more efficient loading and backwashing. 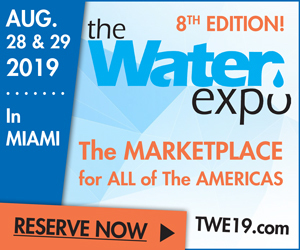 It is recommended that only media meeting AWWA Standard B100-96 and listed under NSF 61 be used in all water filtration applications. Table 5 provides data on a number of filtration media. Filter-Ag® is a naturally-occurring crystalline silica material used exclusively for filtration. The irregular surface of this relatively large-grained medium provides a large surface area and allows deeper penetration of smaller suspended solids. It is capable of filtering suspended solids in the size range of 20-40µ. Filter-Ag Plus® is an ore known as clinoptilolite, containing both silica and alumina. It has microporous void spaces as small as 3µ, producing a surface area over 100 times that of Filter-Ag and is capable of filtration down to 5µ. Anthracite is a type of coal, highly angular and of medium density. It is widely used in multi-media filters as a middle layer. It is available in several grain sizes. Garnet is a high-density medium often used as the lower layer in a multi-media construction. It is capable of filtering down into the 10-20µ range. Filter sand and gravel, typically obtained from glacial deposit soils of low solubility composition, are sized to provide uniform flow characteristics. Filter sand may be used in the upper layers of multi-media filter, while the uncrushed gravel is used as bed support. Diatomaceous earth (DE) is a mined medium comprised of the fossilized remains of diatoms: microscopic, single-celled algae. The chemical composition is 80-90-percent silica. It is generally available as a soft, tiny particle, ranging in size from 5µ to about 1mm, depending upon the specific algae source, location and the age of the deposit. This medium is typically used as a pre-coat and body-feed that must be coated onto a support screen from a slurry to form a stable cake that actually does the filtering. As the cake accumulates suspended solids and the back pressure increases, it must eventually be backwashed off the support and the process repeated with new DE. This technology is capable of filtering down to approximately 0.3µ. Other similar media include perlite and cellulose fiber materials. 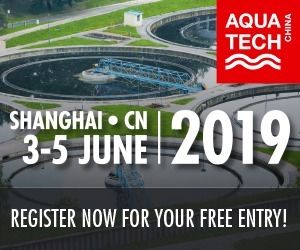 This has been a review of the more widely used media in the water treatment industry. 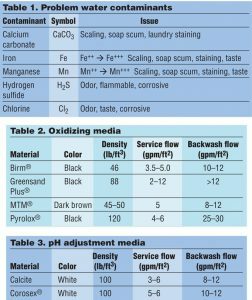 There is no shortage of other media products available to perform the contaminant removal operations described above. Most of these are manufactured for a specific purpose, are expensive and may or may not work as advertised. The author wishes to thank Douglas Haring of Clack Corp. for his assistance.